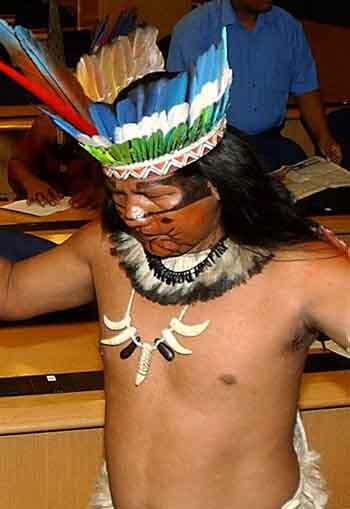 The Munduruku (Mundurucu or Wuy Jugu) are a tribe of South Americans, one of the most powerful tribes on the Amazon. They had an estimated population in 2009 of 10,896. In 1788, they completely defeated their ancient enemies the Muras. After 1803 they lived at peace with the Brazilians. One of the most interesting things about the Mundurucu is their residence pattern. 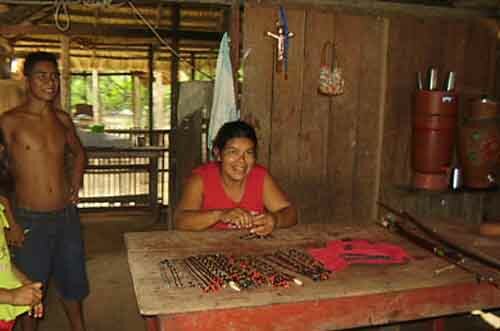 Rather than a pattern based on conjugal or affinal bonds, in the Munduruku villages, all males over the age of thirteen live in one household, and all of the females live with all of the males under thirteen in another. They are also notable for their linguistic separation of "us" (their tribe) from "them" (everyone else), the pariwat. Whereas they refer to themselves as the wuujuyu, or "our people", everyone else is spoken of as the equivalent of "prey". Unlike the Piraha, the Mundurucu have a numeracy system, albeit limited (similar to that found in some Aboriginal Australian cultures). Pierre Pica was instrumental (in a work done in collaboration with Stanislas Dehaene and Elizabeth Spelke) in revealing the psychophysics and linguistic properties of the Munduruku counting system to the Western world. The Mundurucu only have number words up to five, although each word is not as definite in meaning as number words in English. Furthermore, the Mundurucu use the logarithmic scale to approximate number "distance", which is a strategy all humans have been shown to use before more extensive exposure in numbers. All human beings may have the ability to understand elementary geometry, independently of their culture or their level of education. In a South American jungle, far from traffic circles, city squares and the Pentagon, beats the heart of geometry. 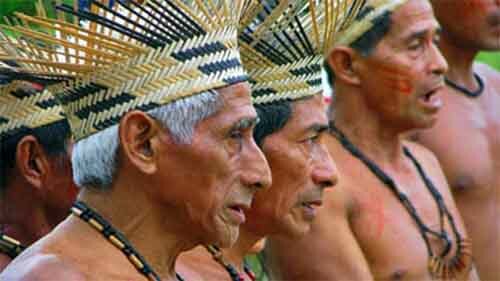 Villagers belonging to an Amazonian group called the Mundurucu intuitively grasp abstract geometric principles despite having no formal math education, say psychologist Veronique Izard, of Universite Paris Descartes, and her colleagues. U.S. children between ages 5 and 7 partially understand geometric space, but not to the same extent as older children and adults, the researchers find. These results suggest two possible routes to geometric knowledge. Either geometry is innate but doesnÕt emerge until around age 7 or geometry is learned but must be acquired on the basis of general experiences with space, such as the ways our bodies move. Both possibilities present puzzles, she adds. If geometry relies on an innate brain mechanism, it's unclear how such a neural system generates abstract notions about phenomena such as infinite surfaces and why this system doesnÕt fully kick in until age 7. If geometry depends on years of spatial learning, itÕs not known how people transform real-world experience into abstract geometric concepts - such as lines that extend forever or perfect right angles - that a forest dweller never encounters in the natural world. The Mundurucu's keen grip on abstract geometry contrasts with past evidence from IzardÕs group that these Amazonian villagers cannot add or otherwise manipulate numbers larger than five. Geometry may have a firmer evolutionary basis in the brain than arithmetic, comments cognitive neuropsychologist Brian Butterworth of University College London. Philosopher Immanuel Kant proposed in 1781 that people possess innate geometric intuitions about space. IzardÕs group sympathizes with that view. Study coauthor and Harvard University psychologist Elizabeth Spelke argues that evolution has endowed people with 'core knowledge' about several domains, including physical space. Other psychologists, such as Nora Newcombe of Temple University in Philadelphia, regard early experiences in moving oneÕs body through space, acting on objects and observing consequences of actions as fundamental to spatial and geometric knowledge. IzardÕs team emphasizes innate geometry over spatial learning in the new paper, Newcombe says. Izard acknowledges her groupÕs initial excitement that Mundurucu insights into geometry supported SpelkeÕs ideas about core knowledge. In 2006 and 2007, Izard and study co-author Pierre Pica of Universite Paris 8 tested 22 adults and eight children in three Mundurucu villages located more than 100 km upriver from any other settlements. Volunteers responded to 21 questions, such as "Can more than two lines be drawn through a point?" and "Can a line be made to never cross another line?" Illustrations of a plane or sphere appeared with each question to depict the problem visually. Mundurucu answered many more questions correctly than would be expected by chance. Accuracy reached more than 90 percent in response to geometric questions about a flat world and more than 70 percent for questions about a spherical world. In both imaginary realms, about 90 percent of villagers agreed on the existence of parallel lines - infinite lines that never cross. Participants estimated the location of the third village by pointing on the screen. Mundurucu then gauged the angle of paths connecting the unseen village to the visible villages. In some cases, Mundurucu reproduced angles with their hands in a V shape, which an experimenter measured with a special device. On other trials, villagers used the measuring device themselves to form missing angles. Average Mundurucu estimates for absent angles on flat surfaces, added to measures of the two visible angles, came within 5 degrees of 180, the constant sum of angles in triangles. Average angle estimates for spherical surfaces, added to existing angles, exceeded the constant sum by 9 degrees to 22 degrees. On the same line and triangle tests, 35 U.S. adults and eight French school children performed comparably to the Mundurucu. IzardÕs team suspected that U.S. 5- to 7-year-olds would show similar geometric insights, providing unambiguous support for core knowledge of concepts about space. To the scientists' surprise, 52 kids in this age range performed better than chance on line and triangle tests but fell well short of marks set by older children and adults. In particular, younger children had difficulty taking into account spherical space when thinking about relations between lines and the size of missing angles in triangles. Izard and her colleagues are now probing the development of geometric knowledge in U.S. and French youngsters during the first few years of life. In a recent study published in the Proceedings of the National Academy of Sciences, psychologist Veronique Izard from the Universite Paris Descartes and her colleagues show how abstract geometric principles are understood despite a lack of formal education. Izard and her team administered geometry-based tests to an Amazonian group known as the Mundurucu. They tested 22 adults and 8 children (ages 7 - 13) and then compared their results with adults and children from France and America (French children ages 7 - 13 and American children ages 5 - 7). One test focused on the geometrical properties of lines, while the other test asked participants to estimate the angle and location of an incomplete triangleÕs apex. Results showed that the Amazonian group, who had no formal education in geometry, had results comparable to their French and American counterparts, with the exception of the American children. American children in the 5 - 7 age group were able to somewhat understand geometric space, but not to the level of the others tested, including those from the Amazon with no formal education. This leads researchers to believe that geometric knowledge is obtained through two possible routes. Either it is innate but not fully developed until around the age of seven or it is learned by experience with space, such as how our bodies move. Kant argued that Euclidean geometry is synthesized on the basis of an a priori intuition of space. This proposal inspired much behavioral research probing whether spatial navigation in humans and animals conforms to the predictions of Euclidean geometry. However, Euclidean geometry also includes concepts that transcend the perceptible, such as objects that are infinitely small or infinitely large, or statements of necessity and impossibility. We tested the hypothesis that certain aspects of non-perceptible Euclidian geometry map onto intuitions of space that are present in all humans, even in the absence of formal mathematical education. Our tests probed intuitions of points, lines, and surfaces in participants from an indigene group in the Amazon, the Mundurucu, as well as adults and age-matched children controls from the United States and France and younger US children without education in geometry. The responses of Mundurucu adults and children converged with that of mathematically educated adults and children and revealed an intuitive understanding of essential properties of Euclidean geometry. For instance, on a surface described to them as perfectly planar, the Mundurucu's estimations of the internal angles of triangles added up to ~180 degrees, and when asked explicitly, they stated that there exists one single parallel line to any given line through a given point. These intuitions were also partially in place in the group of younger US participants. We conclude that, during childhood, humans develop geometrical intuitions that spontaneously accord with the principles of Euclidean geometry, even in the absence of training in mathematics.